The Ordinary Life of an Extraordinary Girl: 2010 - the year of the ??? 2010 - the year of the ??? 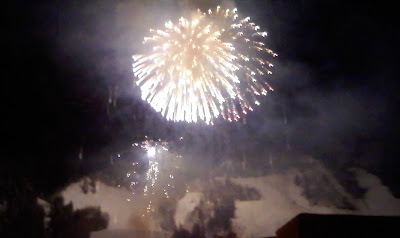 Last night, Alex, John and I went to Aspen to watch the fireworks. Lucky for us there were two sets of fireworks, one at 8:00 and the second at midnight. We went to the 8:00 show, got home by 9:30, and in bed by 10:30 - a perfect New Year's for me! Alex had different plans; when we arrived home, she informed us she was going to stay up until 4 AM to watch the Disney Channel Showdown. Maybe in 2010 we can wean her from the Disney Channel? She did not make it past midnight. This is a good thing - I am not interested in being with a grumpy and tired 16 year old on the first day of 2010. That would be very bad karma! Alex currently has two great fears in life - bugs and loud noises. Fortunately with the temperature in the zero range we did not run across any bugs, but fireworks are very loud. We have found battery operated white noise enabled head-phones to be a life saver when around loud noises. They also work well with her new I-pod touch - although is does allow her to sing very loudly to her music, a bit distracting for us. Alex is usually very good at anticipating modifications that are needed to alleviate discomforts in her life. She almost always has those head-phones with her. But, I say usually, as she does not care about all discomforts. For example, she does not like to wear her coat. I do believe her body temperature is a bit different than mine, and she does not seem to be cold when I am. However, it was zero degrees out last night and I had to fight her about the coat. Happy to say - I won! Picture this...a 16 year old girl with down syndrome on the streets of Aspen with headphones, a red hoodie and a ski jacket unzipped (too much fighting for me). Very humorous – that’s my Alex – about as individual as they come. Alex did add that she wants to be a football player when she grows up - thankfully I do not think that will happen.